Today’s topic during Colorado Flood Safety and Wildfire Preparedness Week is flooding which develops in the time frame of longer than 6 hours to several days. Long duration floods in Colorado can result from snow melt…a combination of snow melt and heavy rain…or just heavy rain. In early June of 1921…a flood along the Arkansas River devastated the city of Pueblo. Estimates of drownings ranged from over 100 to over 300. Around Memorial Day…1935…catastrophic flooding occurred on the Palmer Divide and the Colorado Springs area…causing millions of dollars of damage…and killing at least 18 people. The mid-June 1965 flood was widespread across eastern Colorado…taking several lives…and causing over 500 million dollars of damage. 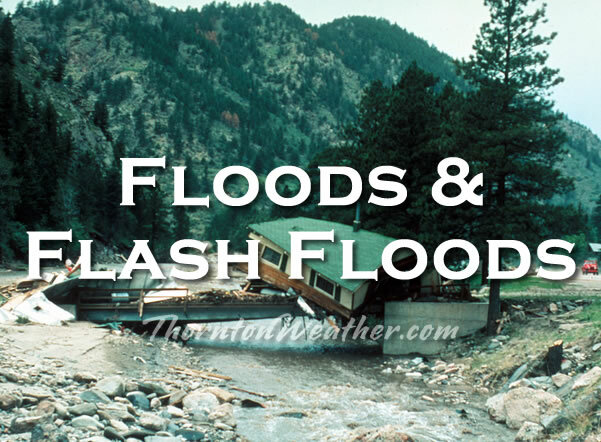 During late April and early May of 1999…after up to 14 inches of rain fell…a major flood occurred across southeast Colorado from Colorado Springs to La Junta. In 2013, the historic rains and floods in September caused over 3 billion dollars of damage, and took 9 lives. Just this last year during May, multiple days of heavy rain and snow caused flooding across many areas of eastern Colorado. Floods in Colorado can result from rapid snow melt, ice jams, a combination of snow melt and heavy rain, or just heavy rain. National Weather Service forecast offices in Colorado closely collaborate with regional river forecast centers that monitor the Colorado River…South Platte River…Arkansas River…and Rio Grande to come to a consensus on the likelihood of flooding along rivers and large creeks. The National Weather Service will discuss flood potential in hydrologic outlooks…daily hazardous weather outlooks…and in graphical weather stories on National Weather Service forecast office web sites. Hydrologic statements may be issued for high flows that are within the banks of a river or large creek. When flooding is possible on a river or large creek…a Flood Watch will be issued…meaning flooding is possible within the designated watch area. When flooding is likely or occurring on a river or large creek…a Flood Warning will be issued…meaning flooding is expected or has been reported at designated river forecast points. This monitoring system can be accessed on Colorado National Weather Service forecast office web sites from the left hand menu…by clicking…rivers and lakes under the hydrology banner. At each river and large creek gauge…you can easily look at current and forecast water levels…flood categories…historic crests…and flood impacts. Probabilities of exceedance of certain water levels by week or over the long term are also available. In general…there will be some time to prepare for river and large creek flooding…and emergency management in your area has plans in place to address flooding issues. Know these plans and how you should act accordingly when Flood Watches and Flood Warnings are in effect. This entry was posted on Tuesday, March 5th, 2019 at 4:10am MDT and is filed under Weather Education. You can follow any responses to this entry through the RSS 2.0 feed. You can skip to the end and leave a response. Pinging is currently not allowed.